While 2018 is just two weeks old, Chris @RUKidingMe44 Hinchcliffe has already established himself as this year's example of #RunGood. Hinchcliffe kicked off the year with a win on New Years Day @TVPokerRoom, following it up six days later by taking home second-place money in the 465-entry OneDay$100k. With the New Year off to a great start for him, Hinchcliffe took his NorCal momentum and headed south last weekend. The Commerce Casino in Los Angeles was hosting its annual LAPC with Matt Savage and Justin Hammer at the helm, one of the biggest series in the US each year. The event he targeted was the $350 buy-in Kickoff Event with a One Million Dollar Guarantee. "Savage and Justin have become friends of mine, and with Matt's ties to here (Thunder Valley) because of all the tournaments he does here with the WPT, I felt like this was where I wanted to play," Hinchcliffe said. Hinchcliffe cashed in one of the first starting flights at LAPC but did not earn a Day2Bag. There were more flights, however, and Hinchcliffe set out to make another run. 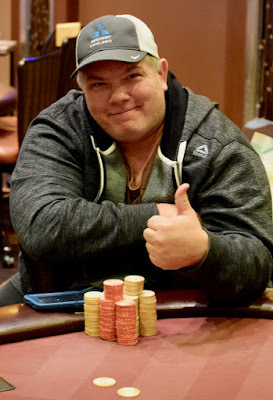 A tournament regular here who frequently lists, "Thunder Valley, CA," as his city-of-residence on his Day2Bags, Hinchcliffe bagged the top stack in another flight at LAPC, and he was 5th in chips when the final table rolled around. Players @TVPokerRoom were on their phones and tablets all throughout the next day, sweating Hinchcliffe's final table play at LAPC to see what would happen. When the tournament was over - from a starting field of 3,956 entries - Hinchcliffe was the one with the Remington in his hand and first place was his, earning him $142,715. With the win, Hinchcliffe's career poker tournament earnings now top the $1 Million mark. I am so incredibly humbled and grateful for this," he said @TVPokerRoom just 24 hours after the LAPC win. "All the great responses I received from friends on Twitter, text, Instagram ... it is almost overwhelming."